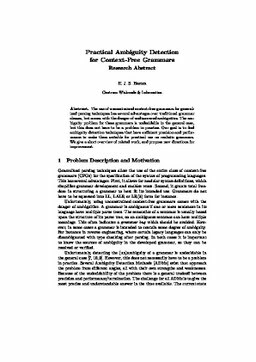 The use of unconstrained context-free grammars for generalized parsing techniques has several advantages over traditional grammar classes, but comes with the danger of undiscovered ambiguities. The ambiguity problem for these grammars is undecidable in the general case, but this does not have to be a problem in practice. Our goal is to find ambiguity detection techniques that have sufficient precision and performance to make them suitable for practical use on realistic grammars. We give a short overview of related work, and propose new directions for improvement. Basten, H.J.S. (2010). Practical Ambiguity Detection for Context-Free Grammars. In E van Wyk & S Zschaler (Eds. ), Proceedings of the 1st Doctoral Symposium of the International Conference on Software Language Engineering (SLE-DS-2010) (pp. 5–8). RWTH Aachen.